We cover a wide array of applications in all fields of development and research used in all production processes to verify quality and process reliability. Handheld and portable Bruker XRF analyzers offer unmatchable metal identification, engineered for ease of use, accuracy, and reliable elemental analysis. See where fit, form, and function all intersect with our metal sorter instruments. Designed for the most demanding customer applications, our rock-solid analytical tools offer fast, precise, nondestructive solutions for alloy identification. Designed for nearly any weather condition, field environment, and location, both the S1 TITAN will give you reliable results in seconds. A Bruker metal tester saves significant expenses in comparison with traditional laboratory testing. 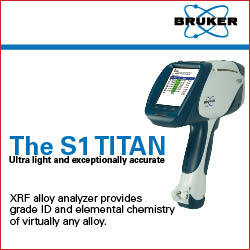 The S1 TITAN model 200 & 300 can detect elements Ti through U. The TITAN model 600 & 800 can analyze elements Mg through U on the periodic table. With shorter measurement times and superior detection limits, our handheld XRF analyzers increase your productivity. For our thousands customers around the world, a Bruker metal analyzer offers a higher profit potential and lower long-term ownership costs. Read about Bruker Elemental’s forthcoming participation in the ISRI Convention 2014 with our XRF Technology.